Andi B. Goode: Now Colour Planned for Every Home! 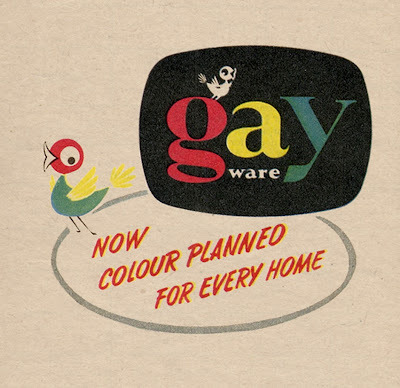 I think it's safe to say that most Australian vintage lovers lust after Gay Ware and I'm certainly no different. 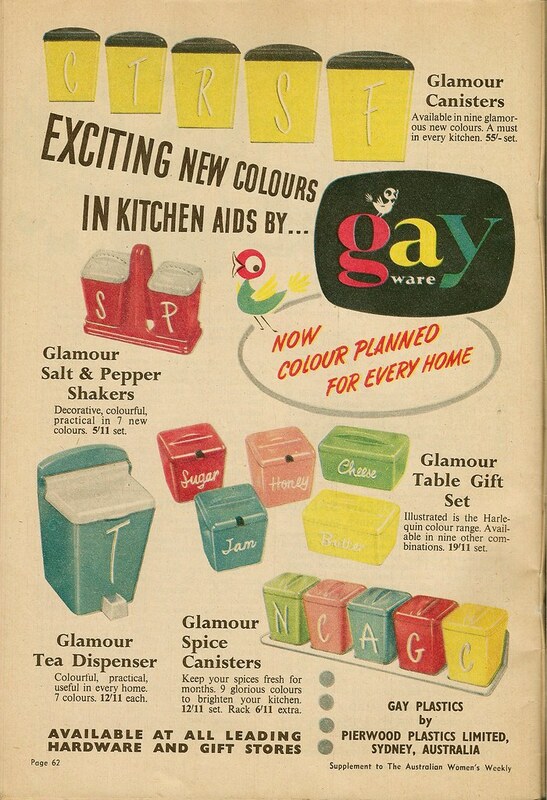 I was beginning to despair of ever finding a set of Gay Ware canisters that I could actually afford when I went to my dad's partner's for dinner the other week. I told my dad how I was on the lookout for some 1950s canisters and his partner brought one of hers out from her pantry and asked 'like this?' I'm sure I said something like 'Yes! Exactly like that' and then she told me I could have them. I honestly couldn't believe my luck. The red and white colour combination is just perfect for my future dream kitchen. 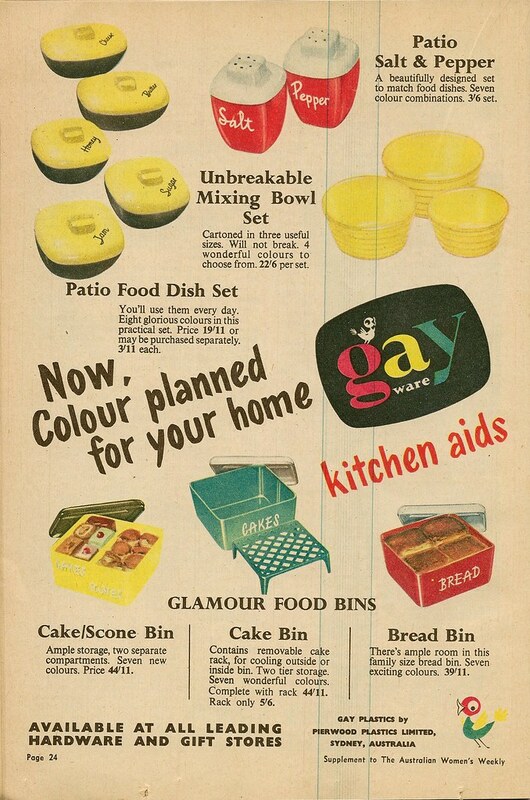 Of course, my search isn't over - as you can see from the two 1950s ads below, there are many items left for me to find to have a complete Gay Ware kitchen. And look at this window display below - I could just cry thinking about walking past a display like this! Though, of course, one thing that's so satisfying about being a vintage collector is when you find something special or that's usually hard to find, don't you think? These are fabulous! 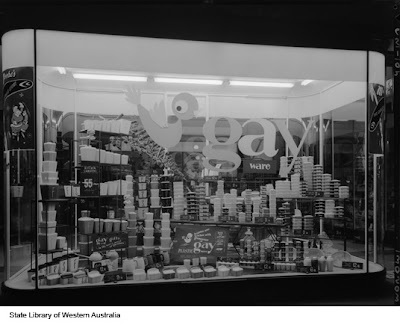 I had no idea what Gayware was, but when I saw the photos I knew exactly what you meant. I'd always known them as Bakelite. You were so lucky. The red and white and pink and grey are my favorites! The patio food dish set looks amazing. Im from the states and I had no clue about gay ware until your post. I love your canisters for your future kitchen, good luck on finding more! Some people just don't know what they have! Lucky girl. Those are AMAZING! But what do the letters stand for? Wow those are amazing! haven't seen anything quite like them here in the UK. I'd love a red & white kitchen too! Oooh lucky you! So pretty! Oh oh I want a 'Glamour' Tea Dispenser too! Oh my goodness I would go gaga over a store like that! Wow, they're so pretty! What a great gift! I'm on the hunt for a perfect set of vintage canisters, it will be fun once we've found a house (someday!) and then I can start planning what colours I want the kitchen to be. Those pastel mini cannisters are so cute! And you're so lucky to be given a nice set - congrats! such a score!I'm in the states but I've always admired Gayware on ebay for years!I have a capri set that is missing the red rice canister.When I move into my new place I'll send you a photo of the exact set so you can be my eyes and hands for snatching one if you ever see a red rice canister for me. Those are completely fabulous. I wish I could find something that nice (or a relative that generous) in my area of town.